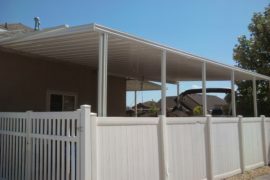 Car ports provide protection from the elements for a wonderful price option. You can protect all your outdoor toys and not worry about the sun’s harmful rays. A big concern with every customer is snow sliding into the neighbor’s property, all our awnings have a built in gutter system and retains all of its own water and snow. Your options and limits are endless, along with colors and styles.